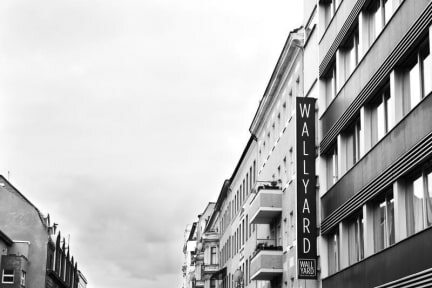 The WALLYARD CONCEPT HOSTEL welcomes you in the heart of Berlin: The Central Station is only 1 bus station away. The Government Quarter, the Zoo, the Friedrichstraße or Kreuzberg are in a few minutes distance, an express bus takes you to Airport Tegel. Our modern look catches the eye: Casual design meets “home sweet home”. The bright rooms are equipped with superb mattresses and comfortable seating. Plan your days in the comfort of our WALLYARD café, the sunny backyard or the bar. Wi-Fi in the lounge and rooms, internet points, luggage storage and honest insider tips are free of charge. Book either a private room with an en-suite bathroom or a shared bathroom or a bed in a dorm. Optional breakfast. Private parking spaces by reservation. Bikes are available for rent. Our house is multilingual, friendly, and a real Berliner. Cancellation policy: 48h before arrival day. Payment upon arrival by cash, debit card, Visa and Mastercard. Bed linen not included: for fresh bed linen, we charge a mandatory fee of 3.90€ per bed for the entire stay on the check in. The bed linen is laying already prepared on your bed upon arrival. We don't accept any stag or school groups. We do not accept groups bigger than 6 people. If you make separate bookings to get around our restrictions, we will cancel the bookings. Guest must be over 18 to stay in a dorm. Children have to be occupied with a parent in a private room. If you don't meet our age restrictions the booking will be cancelled and the deposit is not refundable. Breakfast not included (€5 per person / day). Private rooms towels included / Dorms towels not included (€2 per stay). Nice and clean. Lovely staff! Quite close to Hauptbahnhof Berlin. Very affordable breakfast. Very nice hostel!! But I wouldn't recommend the €5 breakfast, because it wasn't good and expensive for what you get! Simpel hostel met een erg goede lobby waar ze goede muziek draaien en je rustig kan zitten. Super aardig personeel. Wel zijn de kamers erg klein en geven een beetje een gevangenis gevoel. Verder vonden we het ontbijt erg karig en hebben we de rest van de dagen zelf ontbijt gehaald bij de supermarkt (aanrader). Tot slot lag het naar ons gevoel ver uit het centrem dus moest je wel lang reizen voor je ergens uitkwam. 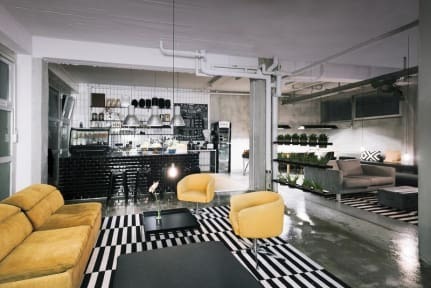 Good location, good vibe and (very important for me) reasonable beds. The staff was super friendly amd helpfull. I really liked staying at this hostel. It's a short walk to the trainstation and within minutes you're in the citycentre if you take a train from there. I do think that if you travel alone, it's hard to really meet people. Their commonroom closes at 9 and than people are not at the hostel or just in their rooms with the doors closed. Prima. Hostel is gevestigd in een oud pand. Geluid in de gang is goed hoorbaar in de kamers maar dit was niet heel storend. We hadden een 2 persoonskamer met eigen douche en toilet. Na het douchen is de vloer nat en zonder trekker om het droog te maken is dat onhandig. Metro en bus zijn om de hoek. Our plane got delayed. Before we went into the airplane we emailed that we would be late. We didn’t literally say we wanted a late check in, but we warned that we could arrive later than 11 o clock. Once in the plane we had another delay. We weren’t alowed to turn on our phones so we couldn’t send another email. When we arrived in Berlin we received an email saying that we had no place to sleep & had to search for a new place in the middle of the night. Next day we had to pay for a no show!!!!!! The location of the hostel is far away from the centre and it's not dynamic at all. Very boring hostel. The rooms were nice and clean, it wasn't just very social.